Absolutely the best bbq grill ever. We still have the the one that my dad bought in 1954. Mom cooked at least 10,000 pounds of beef on it, my brother took it to college, and my son took it to college, I cooked on it. Retired it a few years ago and replaced it with a new PK. Hoping this one will last 3 generations! I have one of the originals that was manufactured sometime in the 1950s. It is still my favorite bbq cooker. My dad passed it down to me…American made, love it. I still have my Dad’s PK that he won in a sales contest with National Old Line Ins. from Little Rock in the mid to early 60’s. Almost 50 years later and the grill works as good (if not better) than when it left the shipping box. I’ve had larger grills when the family was home, but none better than this. Think I’ll buy my children one for Christmas! - in Blacksburg, VA. – Doug T.
I am the proud owner of my Dad’s Portable Kitchen grill and smoker, which was purchase for Fathers Day in 1959, when I was 5 years old. I still use the grill today, as a matter of fact, I have some ribs smoking on it right now. I am in need of some parts for my grill…I plan on maintaining this grill in order to pass it on to my youngest son, who loves to cook, in order to carry on the tradition. If you ever need a customer testimonial, I actually have super 8 films of my dad cooking on this grill in the early ’60’s. Love this grill!!! Martha, first encountered a PK grill and smoker when staying with my uncle and aunt in Hot Springs many, many years ago. Then in the 90’s when I would come to visit and take care of my uncle, I would cook on it. The grill was getting pretty old, was the crossed leg version and the grate was starting to rust out. There wasn’t any such thing as internet then, but I found a grate at Lowes to fit it and we wired the legs up together because it was getting a little bent up. My uncle had been sick and I was able to get him to eat pork chops and steak because I grilled it up. It helped that I had a million hickory nuts that were falling on my head from the trees in the yard and I soaked and used them to smoke/flavor everything. My Uncle Gin taught me that trick. When he passed away, a good friend took the grill and still has it. I loved it so much that when I found one in Downers Grove, IL near my home, I grabbed it up. That was 10 years ago and I’m still rockin’ on it. Nothing fancy, just good old bbq, the way I love to eat. Baked potatoes, grilled vegetables and the best steaks, burgers, seafood and chops ever. I even bring home the hickory nuts every year from Hot Springs from the yard even though my uncle is long gone. Best grill ever!!! Thanks for reviving it. I wanted to write you about my PK grill and smoker (circa 1971). I returned from Viet Nam June of 1970 and was married on June 27(still married to same) and early 1971 went to an Eckerds Drug Store in Charleston, SC and purchased my PK for under $20 if I remember correctly?? This has been my cherished possesion since. It is the best all around grill to this day. I have a nice gas grill but always prefer the PK. As you can see from the pictures it is still in decent shape and the only improvement(hah) being the refrigerator shelf. The cart is original and a bit in need of repair, but still functional. I was having to rig the grates for years until my friend at the Craft Stove Store here in Greenville, SC showed me the new PKs. I immediately purchased the grates and was ecstatic that they were making this wonderful bbq grill again. First, thank you for making the best bbq grill made – ever! I own two of your grills and they are indeed amazing. When I “partner” my two with my brother’s and get three cooking simultaneously, we can turn out some great meals! Thanks again. I received my 1st PK grill and smoker in 1970 as a gift from a friend who had upgraded to the larger mode. It is the one on the left. He had shortened the legs for camping so it could be set on a picnic table. My 2nd was a gift from my wife in 2004. It is the one on the right! The little one had started to burn through after 40 years of heavy use and I was so exicted to see the new one in a local BBQ Grill store! I was also glad to see that I could again get grills for the little one which we still use for camping. Today I was helping my brother in law clean out his recently deceased parents house and what did I see on his scrap pile but a PK Grill and Smoker! Of course I grabbed it! It is the only one I have ever seen that says it was made in Tyler! The inside is great and looks like it has had little use! One of the hinges on the lid has been repaired and I don’t know if the wheels are original or were added at some time. Also, one of the front legs was repaired at some time. Needless to say I will be ordering some new grates for it soon! I tried the grates from the new one and they almost fit. The new one is slightly larger than the one made in Tyler. Last week-end I saw a new portable kitchen grill and smoker in a North Al. hardware store. It looks just like my old grill. I purchased my grill in Dec. 1967 in Montgomery Al. It has seen three states over the years and has required the meat grill to be replaced twice that I can remember. The frame is good. After 44 years the bottom back corner of the grill has finally burned tru. I can not tell you how many new and improved gas and charcoal bbq grills we have purchased over the years. They look great on the show room floor but after cooking a couple of times the rust and corrosion starts the count down. I just wanted to tell you how great your product is and how well it has lasted. My grandfather, Reynolds Seymour, was a salesman for Reynolds Aluminum in the 60’s and 70’s. 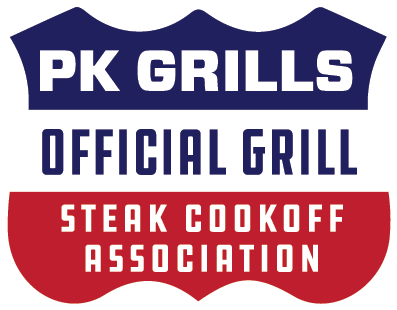 PK grills was one of his customers for much of that time. He used a PK grill and smoker frequently and loved it. He would often give PK grills for Christmas or birthday gifts. The old grill in the attached picture was a grill that he gave to my aunt sometime mid to late 60’s. She gave it to me about 10 years ago. I quickly learned to cook on it. It has served me well for many years. I bought a new grill this summer while in LR. (I live near Eureka Springs). The new grill is the bigger model. It works great for 4th of July, and other occasions when I cook for several people. I’m passing the smaller grill down to my son. It is over 40 years old and has worked wonderfully for 3 generations. Can’t wait to use my new PK grill to cook this year’s Thanksgiving Turkey. I have a pk grill that my father gave me years ago which has been out under the tractor shed after I retired it because they folding stand had been bent. I was glad when I heard you were still in business and I recently purchased the replacement grate, grill and more grill accessory. I used it tonight and experienced again how well it works cooking half chickens. I set it up between 2 metal folding chairs. It worked for tonight but I would like to buy a new stand for it. I want to keep using the body that I have after I found out that my mother had brought it to us when we were living in Lubbock, Texas many years ago. My mom was glad I could refurbish it. I plan on taking it to Galveston for my wife’s 60th in December. I hope I will be able to set the old thing on a new stand. I plan to post my pictures on facebook. It works between the chairs in a pinch. I have used the “[Cook]More grill” accessory for years on another BBQ pit and have found that it works well on gas grills as well. I will be ordering a couple more of those guys as well. As expressed so eloquently by Peaches and Herb, “Reunited and it feels so good Reunited ‘cause we understood There’s one perfect fit And, sugar, this one is it We both are so excited ‘Cause we’re reunited, hey, hey.” That’s right Ms. James, thanks to an itchy index finger, Amazon “one click” ordering and my very patient wife, I will be re-equipped with a brand new Portable Kitchen Grill and Smoker in the next few days just in time for the 9th Annual Porkapalooza at Norfolk Yacht and Country Club, October 16th at 2:00 pm +-. And you’re invited. Again. You no doubt recall that my original PK Grill was purloined from the back yard of my eldest son’s apartment and no doubt has been reincarnated as several hundred TV Dinner containers strewn from coast to coast. Norfolk’s Finest have closed the investigation and placed it among their “Cold Case Files”. I have saved literally for years to replace my lost PK and finally escape the ignominy which comes from being forced to use a Weber. Which really isn’t all that bad once one gets accustomed to it. But it’s nothing like a Portable Kitchen. So Martha, looks like your sales are going up in a down economy. Congratulations. I’m glad to do my part. Please weld 20’ of heavy chain onto that before shipping it. To PK Grill. I recently ordered and received my new PK grill and smoker. I am very happy to have found you. I bought one of your grills around 1970 at the Navy Exchange in Key West FL. I used to cook on the standard round steel grill of the time, which would last about a year and then the KW salt air would rust them out ( it was called the key west crud, attacked everything steel). It also used a lot of charcoal as they had no lid and there was no way to turn them off. The day I saw your grill, avocado green in color, I bought it. The cast aluminum and ability to close it up and save the charcoal for another day was what sold me. I was transferred to Sub Base New London CT in 1972. I brought the grill along and used it for quite a few years. What finally happened was the charcoal grate finally gave out and sagged down where it was no longer usable. The cooking grate was also pretty shabby. The rest of the grill looked great. This was in the early 1980’s. I tried to find replacement grates but could never find anything that worked satisfactorily. I hate to say it but I threw it away and started using a Weber, I think they were all the rage then. There was no internet in those years to do a search. From reading your website I am not sure you were in business in the 80’s, I hope you stay in business long enough this time so when the grates sag again I can buy new ones. The new model is just as great as the old one but I miss the avocado color. I recently purchased my son a PK grill and smoker because of the grill I inherited. We came across a picture of the original PK in its infancy (and I hope that you will be making parts for my old grill soon as I need the charcoal grates and the hinged cooking grid). The picture is my Dad in 1966, Madrid Spain. He was unable to purchase a barbecue grill in Spain (on an overseas assignment) and asked his brother in NY to ship him a “good” grill. What he received is the pictured PK that still lives, cooks and grills to this very day. How many grills last 42 years? I still use this vintage PK as an everyday grill. My Name is Richard and three generations of my family have been using pk grills for over 40 years (since I was in my teens), I own three ( 800 series, one primary and two for parts) and my son has another that have survived the years with only grate replacement and minor stand repair, I even have the folding stand which makes my PK truly portable. I am glad you have resurrected the line and hope you will include the Presidential Model (1200 series, the largest) in your line up some day . when Club aluminum took over the product in the 80s was the last time I was able to obtain grates, and I have been nursing the grates for all these years, I have included for your perusal scans from an original PK booklet from the 60’S, maybe you can reprint some of the recipes within. Thanks for bringing back this product, I wouldn’t part with mine for all the webers in the world! !